As a business owner, your time is limited. You’re wearing several different hats and juggling many roles, each of which requires precious time out of your day. And chances are, you probably don’t have many hours to spare. We’re all looking for ways to make the most efficient use of the 24 hours we’ve been given. 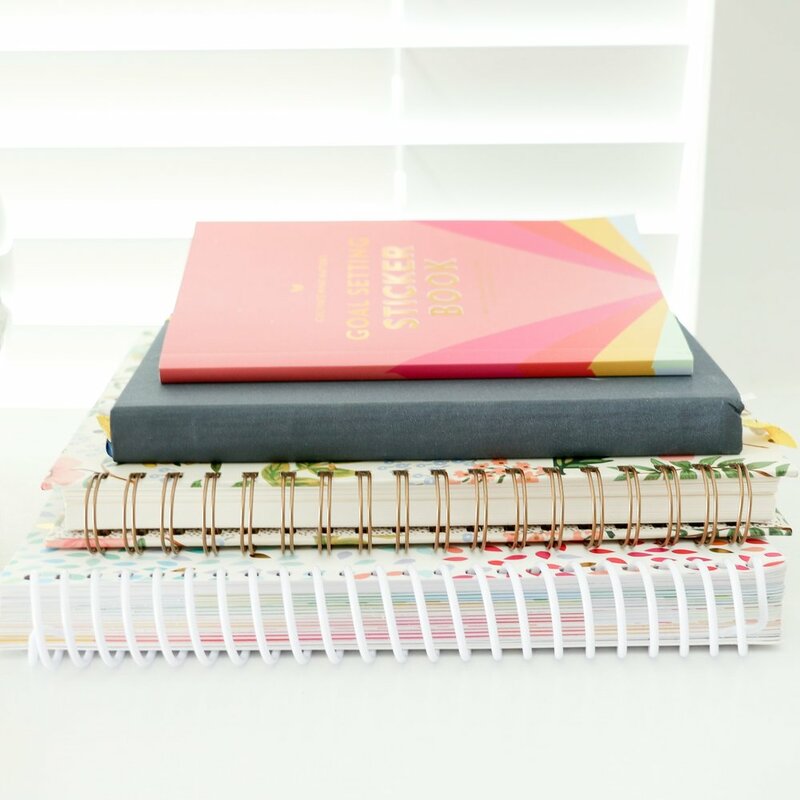 So I’ve rounded up my favorite time-saving hacks - 1 for each hour of the day - in hope of helping you create a little more room in your busy schedule. It’s easy to post sporadically on social media. You might come across an article or photo to share, spend time coming up with a caption before sharing it, check your feed to see new posts... and before you know it, you’ve spent 30 minutes on Instagram. It’s far too easy to get sucked in. Choosing a time each day to schedule posts all at once not only cuts back on distractions throughout your day but it also forces you to become more intentional with the content you’re sharing. It’s a win-win. We use Buffer to schedule our posts each day, but Hootsuite and CoSchedule are popular tools for scheduling social media, too. Buffer also allows you to share 1 post on multiple platforms with the click of a mouse. Instead of spending time setting up each individual post on each individual platform, you can add text/links/graphics, choose the platforms you want the post to publish to, and you’re done. Do you have a habit of accumulating browser windows and keeping the tabs visible as you work online? By keeping tabs open for email and social media accounts, it’s often much more tempting to click on them each time a notification appears. The back and forth between social media, emails, and work can cut back on productivity. If you can relate, consider x-ing out of each tab you aren’t using throughout your workday to cut back on distractions and stay on task. Just like #3, phone notifications can be difficult to ignore throughout a workday, especially if your phone is always close by. Consider turning off notifications to remove the temptation of checking Twitter each time your screen lights up. Do you receive a lot of form submissions each day? Create an FAQ page (if you haven’t already) and link to it on your contact page. Place the link in a prominent place and encourage inquirers to take a look at the FAQs before submitting a contact form. Not only does it help you cut back on emails, but it also saves the inquirer time if you’ve already made the answer to their question available. Are you sending out similar email responses on a regular basis? Instead of writing a new message each time someone inquiries about your services or asks a question you’ve answered in-depth 10+ times in the past, create a canned response. Many people keep email templates in Evernote or in a Google Doc and copy and paste the responses each time they need to send a reply. However, there’s a function in Gmail called Canned Responses that allows you to save email templates and add them directly into an email with the click of a mouse. It’s genius. Whatever way you choose to go about it, canned responses can save you a lot of time tackling your inbox. Boomerang is another great app for Gmail users that allows you to take control of when you send and receive emails. You can choose the day and time an email will send (which is perfect when you’re answering emails at odd hours) and you can also “boomerang” incoming emails and choose a time for them to reappear in your inbox. Implementing tools like Boomerang to develop a process and take control of your inbox can save time and energy in the long run and help you become more efficient with staying on top of emails. Long emails take time. Not only do they take time to write, but they take time to read and respond to. Instead of writing a novel within each message, make it a goal to write short, concise emails in order to save time on your end and respect the time of the person on the receiving end. Focus on direct outcomes and be clear about the next steps that need to be taken, what you need from the other person, questions you have, etc. Don’t beat around the bush; get to the point. For those of you who fear short messages because you don’t want to seem impersonal, you can still be friendly while keeping your email concise. Have you ever been involved in an email chain that goes back and forth without any resolution? Instead of wasting time in your inbox, communicate the old-fashioned way and give the person a call or schedule a meeting. Talking often takes much less time than typing and it cuts back on wait times, too. Can you write a response to an email in 2 minutes or less? Instead of clicking out of the message and putting off a response until later, go ahead and tackle it to get it out of the way. It will save you time in the long run and cut back on the stress of a growing inbox. Have you ever had a meeting run on for much longer than you originally anticipated? We’ve all been there, and it usually ends up robbing other tasks of your time. By leaving meetings open-ended, you’re setting yourself up for disaster. So nip them in the bud at the outset. Instead of scheduling a meeting for 2:30pm, schedule it for 2:30-3:00pm. Set expectations for the person on the other end in order to be cautious of your time and respect their schedule, too. Now that you’ve set expectations for the length of your meeting, set expectations for what you’ll tackle during the meeting. Outline the purpose and make it clear to the person on the other end to prevent rabbit holes, accomplish what needs to be accomplished, and save time. Sometimes in order to save time, you have to put in time. To help stick to the parameters of a meeting and respect the time of the person on the other end, put in the necessary work ahead of time so you can come to the meeting prepared. Do everything on your end to ensure that the meeting runs smoothly and has a productive outcome. Do you have a hour-long car ride or long layover ahead of you? Kill 2 birds with 1 stone and make good use of that extra time by scheduling a meeting. Not only will it free up your schedule later, but it will also make the travel time pass by more quickly. Blog templates are great for consistency but they’re also great for working efficiently. Adobe Illustrator allows you to create and save templates, so spend a little bit of time setting one up for your blog graphics. Create a consistent color palette, customize your workspace with the tools you use most often, and come up with a layout. The next time you’re in need of a blog graphic you can simply open the template, switch the colors and the type, and you’ll be good to go. 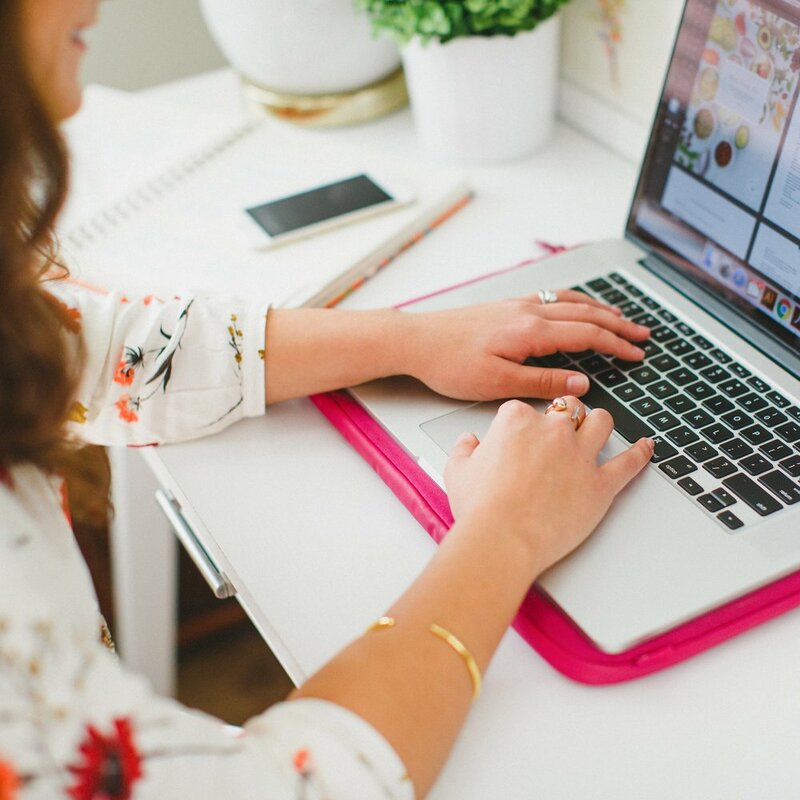 For tips on how to create consistent, well-designed blog graphics, check out last week’s Elle & Company newsletter here. Creating systems and workflows allow you to work faster and more efficiently in all areas of your business, especially in the area of blogging. Figure out a system that works best for you and continue to make refinements. For Elle & Company, we create a new Google Doc at the outset of each post and brainstorm a catchy blog title before we ever write the first sentence. Once we’ve settled on the title, we’ll outline the post and think through a storyline/objective. It makes it much easier to go in and “put meat on the bones” afterward. Once the post is done, it gets copy and pasted into Squarespace, formatted, categorized, and tagged. A quick graphic is made from an Illustrator template and then we schedule it to post at 6am during the week. Your schedule might look different from ours, but having a system in place makes it easier to crank out solid posts and save time in the long run. Set aside time each month to come up with a bunch of topics and schedule them into an editorial calendar. Knowing what to expect prevents scrambling around last-minute and gives you more time to think through what you’ll include in your post (which often makes an article easier and quicker to write later). Again, a little bit of scheduling can go a long way and cut back on wasted time. Interruptions and multitasking can be detrimental to productivity. Instead of trying to pat your head and rub your stomach, focus on doing one task at a time. You’ll get things done much quicker and save some stress and frustration while you’re at it. It’s hard to get tasks done if you don’t plan time in your schedule to tackle them, so create time limits for your to-do’s by time blocking. If you need to tackle an out of control inbox, set aside an hour and make a game out of getting to inbox 0 by the time the hour’s up. If you’re working on proofs for a client, set aside 2 hours during your workday to crank them out. You might even use this system at the outset of your workday by looking at the tasks at hand and scheduling blocks of time to conquer each one. Not only does this help you stay on track, but it also puts some good pressure on you to beat the clock and get things done. If you’re odd like me, you can even trick yourself into making a game out of it! Do you feel like you’re working all day but never getting anything done? Start documenting the amount of time it takes you to complete a task. Go about this for a week or two and then look back at where you spent the greatest amount of time. If a certain area of your business is taking an absurd amount of time, brainstorm ways you can work more efficiently or outsource the task and pass it off to someone else. In our 3 years of marriage, I’ve noticed that Jake always eats his least favorite part of a meal first. He hasn’t said it out loud, but I know he chokes down salad or veggies first to get them out of the way and enjoy the rest of his dinner. There are always some tasks we’re more excited to accomplish than others. But the more we procrastinate and put off the less-appealing to-do’s, the harder they are to check off. It ends up wasting time in the long run and delaying the inevitable. Instead, take the Jake approach and tackle your least favorite tasks first. You’ll end up having a less burdensome workday as a result. It seems so simple, yet it can make such a difference. By keeping a list of every task that needs to get done, you prevent important details from slipping through the tracks. Seeing everything at a glance also helps you set priorities and plan for to-do’s within your schedule. The time it takes you to complete small tasks can add up quickly, especially if you’re checking off small to-do list items at random. To save time, get strategic and batch small tasks. If you have a number of small 5-minute tasks, list them down and set aside a block of time to conquer them all at once. If you have to run several small errands, fit them into one trip and knock them out in one fell swoop. The longer I’ve been in business, the more I’ve realized that while the number of items on my to-do list and emails in my inbox grows, I still only have 24 hours in my day to get everything done. To free up time in my schedule, I’ve had to delegate tasks and outsource a few things to other people. As your business grows and changes, you might find yourself in a similar situation: too many tasks, not enough time. If you have the resources, consider delegating the tasks that take the most time and could be completed by anyone. Focus your time and energy on the things that bring in an income and hire help for the rest as you’re able. We’re all given the same 24 hours in a day. How will you use yours? Which of these time-saving hacks is your favorite? What are some of your best productivity tips for business?